For many, the best way to enter the healthcare field is to become a CNA. 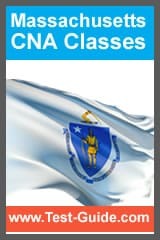 In Massachusetts, you have many CNA classes to choose from - so we are help to help you decide. The key to finding the best CNA program for your needs is to understand the education requirements and evaluating approved providers. Your first step is to look at the list of approved CNA providers that Test-Guide.com has compiled below. Many of the providers can provide you information if you select the "Get Admission Info" button for the program you are interested in. To help you get a CNA job, we've also listed information on: education requirements, passing the exam, and the local Massachusetts CNA job market. Start Here - to find your CNA Program! The details on each of these steps are listed below. Massachusetts follows the Federal guidelines related to Certified Nursing Aides. In general, if you want to work as a CNA you need to successfully complete an approved CNA program, pass a two part CNA exam, and get placed on the Massachusetts Nurse Aide Registry. The admissions requirements will vary by provider, but many programs will allow you to start their programs even if you don't have a high school diploma or GED. Some programs, however, have entrance exams that will assess your basic skills in math, reading and writing. Any nursing home that receives Medicare or Medicaid funding will need to meet Federal training and assessment requirements that are approved and administered by their state. In Massachusetts, the CNA requirements are specified by the Massachusetts Department of Public Health. Nurse Aide training programs are required to meet or exceed the Federal regulations which require 75 hours of training with at least 16 hours of supervised clinical training. Individual state programs must meet or exceed the Federal requirements. At the present time over 30 states have training requirements that exceed the Federal minimum guidelines. The CNA curriculum is required to cover required topics and train the student in specific skills. The required skills are taught through a minimum 16 hours of training at a supervised clinical environment. The clinical training teaches the following skills: controlling infection; proper emergency procedures; interpersonal and communication skills; fostering residents' independence; and respecting the rights of residents. Basic Restorative Services - proper positioning and turning; self care training; using assistive devices; bowel/bladder training; maintaining range of motion; and using orthotic and prosthetic devices. Basic Nursing Skills - ; caring for residents when death is near;recording height and weight; taking vital signs; caring for environment; recognizing abnormal changes. Residents' Rights - maintaining privacy and confidentiality; helping resolve disputes and grievances; avoiding the need for restraints; maintaing security of personal property; promoting personal choices; and promoting the resident's right to be free from mistreatment and neglect. Mental Health and Social Service Needs - awareness of developmental tasks related to the aging process; responding to resident behavior; utilizing resident's family for emotional support; changing CNA's behavior in response to resident's behavior; and allowing the resident to make personal choices. Personal Care Skills - skin care; bathing and grooming; dressing; toileting; transferring, positioning and turning; and helping with eating and hydration/drinking . Care of Cognitively Impaired Residents - appropriate responses; managing needs of resident's with dementia; understanding behavior; reducing impact of cognitive impairments; and communicating . CNA Programs in Mass. must meet or exceed the Federal guidelines. Currently, Massachusetts only requires its approved programs to meet the guidelines of 75 training hours and 16 hours of clinical training hours. Most Massachusetts programs, however, exceed these standards and offer additional training. In Massachusetts, the approved providers include: American Red Cross, Community Colleges, Technical/Trade Schools, and nursing homes. View the complete list of Massachusetts Approved CNA Classes here. You must pass a two part CNA exam to work as a CNA in Massachusetts. The Massachusetts Department of Public Health is responsible for specifying the content of the exam, the passing scores, and which candidate's are eligible to take the exam. Massachusetts has partnered with the American Red Cross to use the Nurse Aide Competency Evaluation (NACE) testing program. The NACE exam has two parts: a written knowledge test and a clinical skills test. The written test consists of 60 multiple choice questions given in a two hour time frame. The skills test is given in a one-on-one environment with a RN test administrator evaluating the skills performed. Candidates are given 4 attempts to pass the knowledge exam and three attempts on the clinical skills portion. Test-Guide.com's CNA Practice Test will show you what the questions look like. Urinary system – Urinary Tract Infections, Urinary Incontinence, Urinary Retention, Catheter Care, Perineal Care. The current examination fees for the Massachusetts NACE Written Examination and Skills Evaluation are $93 ($103 if the exam is given orally). You can find more information by viewing the Massachusetts Nurse Aide State Testing Candidate Information Guide (PDF). Anyone working as a nurse aide in a Massachusetts nursing home must be listed on the Nurse Aide Registry. A nursint homes and other facilities are required to contact the Massachusetts registry to verify that a CNA has met their competency evaluation requirements and maintained their employment status. To get on the nursing registry in Massachusetts, you must have: completed an approved training program, passed the Massachusetts NACE exam. If you are a CNA from another state, you can get listed on the Massachusetts registry by applying for reciprocity. There is a growing demand for CNAs in Massachusetts because of the growth of elder care. Nurse aides provide help nursing staff provide basic care for nursing home residents and hospital patients. In the United States the CNA job market is expected to grow by about 21% over the next decade. In Massachusetts, there are expected to be 1,420 CNA job openings per year (over the next 10 years) which is a 17% growth rate. The median CNA salary across the United States is $12.07 per hour or $25,100 per year. The median salary for CNAs in Massachusetts is $14.02 per hour, which is equivalent to $29,200 per year. People seeking a career in the growing healthcare field often choose becoming a CNA as an entry point. Through further education and training, CNAs can grow their careers by becoming a LPN (licensed practical nurse) or RN (registered nurse). Care Aide - Great Pay w/ FREE Homemaker Training! Health Care Training Services, Inc.
Mt. Wachusett Community College Nursing Dept. Commonwealth Nursing Services & Home Care Inc. Spectrum Healthcare Training Center, Inc. Greater New Bedford Reg. Voc. Tech. H.S. Quincy Public Schools Center for Tech. Ed. Bristol-Plymouth Reg. Voc. Tech. H.S. Cape Cod Community College / North Bldg. Lower Pioneer Valley Career & Tech. Education Ctr.